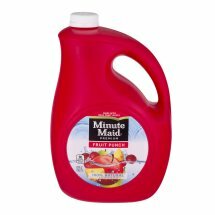 Minute Maid Premium Fruit Punch. Minute Maid® Premium Fruit Punch. Made with real fruit juice†. 90 calories per 8 fl oz serving. †A blend of grape, pineapple, pear and apple juices from concentrate and other ingredients. Recyclable in communities with facilities for colored HDPE. Contains Pure Filtered Water, High Fructose Corn Syrup, Grape and Pineapple Juices from Concentrate, less than 1% of: Pear and Apple Juices from Concentrate, Natural Flavors, Citric Acid (Provides Tartness), Sucralose, Grape Skin Extract (for Color).